Scooper - Technology News: Breeding unicorns in Africa: is this the first of many? Breeding unicorns in Africa: is this the first of many? While tech “unicorns” coming out of Silicon Valley are starting to sound like a dime a dozen, the first tech unicorn to come out of Africa, Africa Internet Group (AIG), is causing a stir. Growing into a unicorn — a privately held technology company valued at $1 billion or more — is a significant milestone for AIG, says Wharton management professor David Hsu . AIG is the parent company to a network of 10 consumer-driven Internet businesses: Jumia (an e-commerce platform), Zando (shoes and clothing), Hellofood (a food delivery service), Kaymu (an online resale marketplace), Lamudi (a real estate classified platform), EasyTaxi (a cab-hailing service), Jovago (a hotel-booking portal), Everjobs (a jobs classified site) and Carmudi (a car-selling platform). Started in 2012, AIG now operates in 23 African countries. One of AIG’s main backers is Rocket Internet, the German company that’s been called a start-up clone factory . Rocket’s regional Internet branches are broken down as Africa Internet Group, Middle East Internet Group, Asia Pacific Internet Group and Latin America Internet Group. Ihrig’s research shows that the creative imitation strategy is especially powerful for global entrepreneurs operating in environments with advanced information and communication technology. “Maybe 10 years ago, this wouldn’t have been so easy. Now with the Internet, new venture ideas spread around the globe and it’s easier to replicate them,” Ihrig explains. The deal with AXA is mutually beneficial, according to Aubrey Hruby, co-author of The Next Africa: An Emerging Continent Becomes a Global Powerhouse and an advisor to the Wharton Social Impact Initiative. She explains that, in a continent where as much as 60% of people pay for health care out of pocket, the business potential is huge for an insurance company to offer products like car and motorbike insurance as well as crop and climate insurance. You can give a long leash for such a venture, adds Hsu. The potential for credit scoring or centralizing information by a financial institution could bring a lot of value to converting customers to AIG’s platform. That data could be used for multiple purposes that could be beneficial for broad financial transactions, Hsu points out. Jumia has found the most success in Nigeria, which has a rapidly growing consumer sector powered by an emerging middle class, notes Hruby. Nigeria is Africa’s most populous country with more than 177 million people and is expected to be home to double that number in 25 years, adds Hruby. It’s also Africa’s largest economy based on GDP. According to McKinsey’s Global Institute , trade in Nigeria is expected to increase by an average of 8% a year, tripling to $1.4 trillion a year by 2030 and become the largest sector of the country’s economy. Crude oil accounts for 90% of Nigeria’s exports and bolsters about 75% of the government’s consolidated budgetary revenues, according to the World Bank . But despite the downturn in oil prices, consumers still need staples, notes Ihrig. “Imports will be more expensive as oil prices slide, which will make firms shift to locally made goods,” adds Hruby. 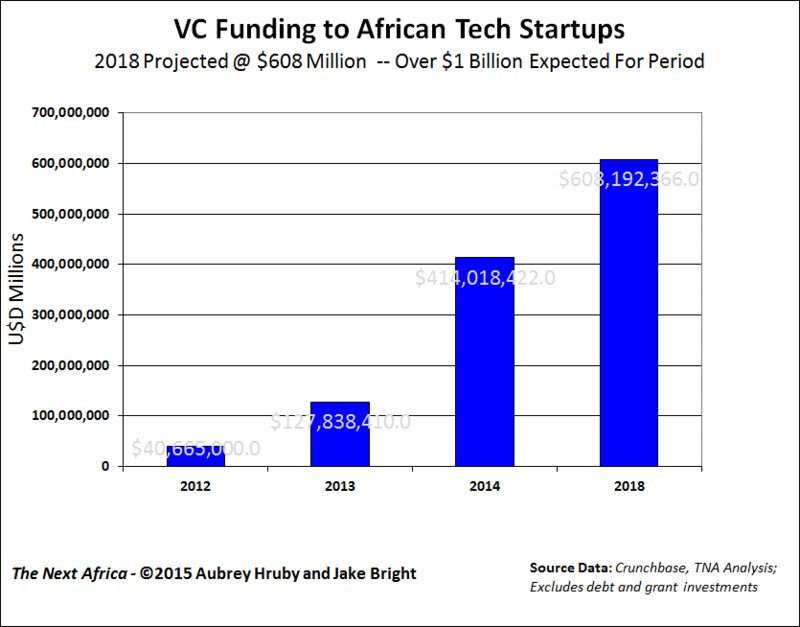 AIG isn’t the only tech venture in Africa bubbling up to the billion-dollar level. “Interswitch is an important one,” says Hruby. Founded in Nigeria in 2002 by Mitchell Elegbe, Interswitch processes digital bank payments and owns a debit-card provider. A London-based private-equity firm, Helios Investment Partners, is one of its main backers, paying $96 million in 2010 for a 52% stake. Helios said in February that it plans to sell its stake in Interswitch, which is expected to attract strong investor interest. According to a Bloomberg report from June , Interswitch is considering IPOs in London and Lagos later this year. By going public in both countries, the firm will have greater access to more capital markets. Listing locally in Nigeria may be for political reasons, says Hruby, but the company can raise the majority of the needed capital externally by demonstrating it can meet British regulatory standards — something that will give investors a lot of confidence, adds Hruby. Hruby notes that entrepreneurs who have worked at AIG have also left to start their own ventures, similar to the “PayPal mafia” that spawned YouTube, Yelp and LinkedIn. Africa Courier Express (ACE), an e-commerce logistics start-up, and SureGifts, a gift-card retailer, were both started by former Jumia employees. Ihrig points out that at least in the offline world “there are usually two to three players that coexist in a market, like McDonald’s and Burger King or Chipotle and Qdoba.” In a place like Africa, with financial markets and transportation infrastructure still in its infancy, all of these fledgling firms need each other to build out the sector, Hruby points out. Another adaption to the African market is Jumia’s option of accepting cash on delivery instead of pre-paying by credit cards, the practice Amazon generally uses. Klein explains that Jumia has been more “astute in how they adapt to the African market.” She notes that people are more comfortable exchanging products for cash, like in a street market. Hsu points out that India has the same sort of cash culture and Indian tech “unicorn” Snapdeal, an Amazon-like clone founded by Kunal Bahl , has had to adapt its payment models as well. “If there’s a profit motive, it’s a powerful mechanism to foster innovation to overcome some of these challenges, and not taking these [financial models] as fixed,” says Hsu. Moreover, Hruby points out that Chinese firm Alibaba has experience in entering emerging markets without a heavy dependence on credit cards. Though sub-Saharan Africa leads the world in consumers having mobile money accounts, only 12% of adults have one, compared to 2% worldwide, according to the World Bank . Of that 12% figure, 45% use only a mobile money account to do their banking. According to the World Bank’s Global Findex Data in 2014, only 34% of adults in sub-Saharan Africa had a bank account at all so that leaves the majority of people without any link to a mainstream financial institution. “Cash is still king,” says Hruby. In Nigeria, there’s a cultural norm of a cash culture where people still buy houses and cars with suitcases of cash, explains Hruby. In Kenya, M-Pesa, a mobile money platform started by a telecom company, is becoming the norm, but Nigeria is behind Kenya in mobile payments. In Nigeria, they “do credit card sales or cash but very little mobile money,” adds Hruby. People still don’t trust the credit card system because online fraud is rampant. Amazon itself hasn’t really gotten a foothold in Africa, letting the upstarts figure out how to handle the logistical challenges first, like figuring out infrastructure issues and financial payments. “The interesting question is: What will Amazon do? Will they buy Jumia or go into the African market themselves?” notes Ihrig. Rocket Internet co-founders the Samwer brothers also have experience in selling their clones to the companies they got the ideas from: eBay bought its clone Alando from Rocket Internet in 1999. Another question to ask, says Hruby, is what will Alibaba do, since the Chinese company is more experienced in going into emerging markets.